Frances Mackay, farmer of Golticlay, died 1869. Wife Ann Sutherland died 1833. John Mackay died at Borgue 19th Febuary 1915. Wife Christina Bruce died at Borgue 6th November 1915. Erected to their memory by their family. Francis Bruce Mackay, Supt Metropolitan Police, Chevalier of Crown of Italy, Order of Crown of Belgium, born Acherole 1862 died Hendon 1951. 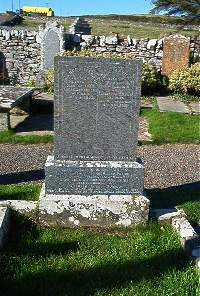 Wife Elizabeth Scott of Morfoot interred here.